Well look what we have here! The week of Thanksgiving is upon us. I'm not going to lie -- I'm not ready for it yet. But I'll be heading to the Los Angeles area for the turkey day weekend, and I'm certainly looking forward to some stuffing. Stuffing is the best. Are you guys ready for the upcoming holiday weekend? Let me know your plans below. Maybe you have a friendsgiving? So about the look: you know that I'm a big fan of the color gray. So shout out to Wild Blue Denim for hooking me up with this all gray ensemble. 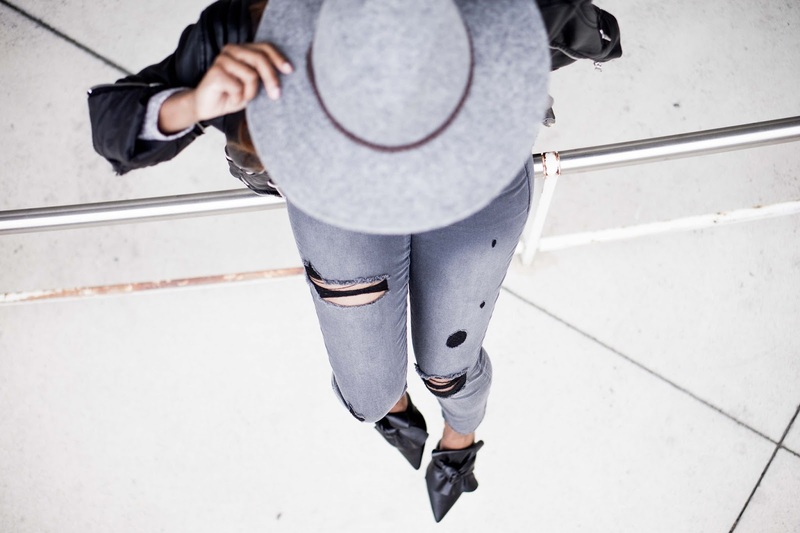 I can never say no to destructed denim. Don't you find it to be so fun? And the ankle fit allows me to really show off my awesome Zara mules. If you want an even better shot of them, be sure to check them out on my Instagram. And the lace-up sweater I'm wearing is also from Wild Blue Denim, which you can shop at Rue21. And you want to know a secret? I'm actually wearing this sweater backward. It was clearly supposed to be business in the front and party in the back, but I really loved how the back looked so why not flip it to the front, right? I even stopped at Starbucks wearing it this way and the barista loved it! I really think it was totally meant to be worn like this. What do you think? This is also the first time I'm busting out the faux leather jacket this season. It was super cold and oh so necessary. Sometimes I really enjoy the fall/winter weather. But other times, I really can't stand how muggy and cold and windy it can get. Would you believe that it's actually raining in these photos? And don't get me started on the absurdity of it getting dark at 5:30 these days. And today is also the Monday Mingle Linkup that I host with Momtrends and Take Time for Style! I'm hosting the linkup today so please add your post below! these mules are so amazing and this whole look is perfect. MY thanksgiving will be pretty laid back so I'm looking forward to the long weekend. I would have never thought you wore that top backwards. It looks so good!! I loveee that top! It's so odd to me to travel back during the winter months now. Early sunsets are no bueno! I love that you flipped the script on this top. Never would've guessed you were wearing it backwards. I know what you mean. Not a fan of these short days either. The detail in that top is incredible! It looks so good. Wouldn't have known if you didn't mention. I agree: this sweater was meant to be worn backwards.. maybe the tag was sewn in incorrectly ?! The entire outfit is Amaze-balls per usual and the hat makes an awesome statement piece! Awww! You look lovely! Listen - count your lucky stars you aren't up North in Canada. We just received about 7 inches of snow and it is STILL snowing. SIGH. I love your shirt and that you wore in backwards! Love this look! The mules are awesome! I've been eyeing those for a while! Ooooo...thanks for the idea on wearing a top like backwards. Me likey! :D And yes...can't go wrong with distressed jeans. I wish all my jeans are like that, you know? PS I hate that it's dark sooooo early now too! I Love this look on you and that top is so special. Only you can tell that the top is worn backwards. Those shooze look good too. . . So stylish! Love the details of the whole look! This look is edgy, put together and comfortable! Love the hat on you. Welcome by tomorrow (a day early) and linkup with me Cheryl. Thanks and Happy Thanksgiving! Fabulous look! Love that lace up top!